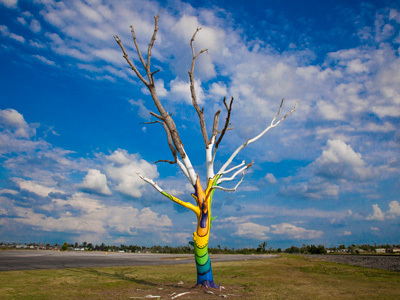 Multi-colored "Spirit Tee" tree in Joplin, Missouri, one year after the tree was stripped bare by an EF-5 tornado on May 22, 2011. Joplin, Missouri, May 20, 2012, 6:03 p.m., Canon 5D Mark II, EF 24-105 mm f4.0L IS USM, f/18.0, 1/800 sec., ISO 800. Photo by Christopher Mardorf / FEMA. American flag near new home construction in Joplin, Missouri, one year after Joplin was struck by an EF-5 tornado on May 22, 2011. Joplin, Missouri, May 21, 2012, 8:15 p.m., Canon 5D, EF 70-200 mm f2.8L IS USM, f/4.5, 1/400 sec., ISO 400. Photo by Christopher Mardorf / FEMA. Devastated home near S. Grand Ave. and E. 22nd St. in Joplin, Missouri, one year after Joplin was struck by an EF-5 tornado on May 22, 2011. Joplin, Missouri, May 23, 2012, 4:56 p.m., Canon 5D Mark II, EF 24-105 mm f4.0L IS USM, f/11.0, 1/250 sec., ISO 400. Photo by Christopher Mardorf / FEMA. Devastated building in Joplin, Missouri, one year after Joplin was struck by an EF-5 tornado on May 22, 2011. Joplin, Missouri, May 21, 2012, 8:04 p.m., Canon 5D, EF 70-200 mm f2.8L IS USM, f/7.1, 1/400 sec., ISO 400. Photo by Christopher Mardorf / FEMA. Devastated building in Joplin, Missouri, one year after Joplin was struck by an EF-5 tornado on May 22, 2011. Joplin, Missouri, May 21, 2012, 8:08 p.m., Canon 5D, EF 70-200 mm f2.8L IS USM, f/3.2, 1/200 sec., ISO 400. Photo by Christopher Mardorf / FEMA. New home construction near W. 26th St. and St. Wall Ave. in Joplin, Missouri, one year after Joplin was struck by an EF-5 tornado on May 22, 2011. Joplin, Missouri, May 21, 2012, 7:50 p.m., Canon 5D Mark II, EF 24-105 mm f4.0L IS USM, f/11.0, 1/250 sec., ISO 400. Photo by Christopher Mardorf / FEMA. Lynn Onstot hugs Barb Sturner in Joplin's Cunningham Park, one year after Joplin was struck by an EF-5 tornado on May 22, 2011. Joplin, Missouri, May 23, 2012, 11:07 a.m., Canon 5D, EF 28-300 mm f3.5-5.6L IS USM, f/10.0, 1/250 sec., ISO 320. Photo by Christopher Mardorf / FEMA. New home construction near W. 26th Street and S. Wall Ave. in Joplin, Missouri, one year after Joplin was struck by an EF-5 tornado on May 22, 2011. Joplin, Missouri, May 21, 2012, 7:55 p.m., Canon 5D, EF 70-200 mm f2.8L IS USM, f/10.0, 1/800 sec., ISO 400. Photo by Christopher Mardorf / FEMA. Hand-written, hope-inspired graffiti in Cunningham Park in Joplin, Missouri, one year after Joplin was struck by an EF-5 tornado on May 22, 2011. Joplin, Missouri, May 21, 2012, 8:26 p.m., Canon 5D Mark II, EF 24-105 mm f4.0L IS USM, f/4.5, 1/125 sec., ISO 1600. Photo by Christopher Mardorf / FEMA. 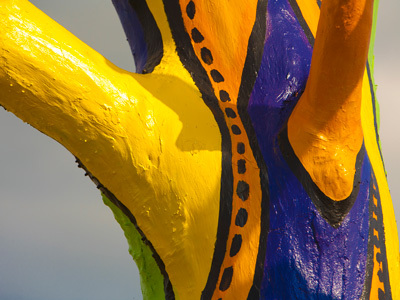 Colorful, painted branches of the "Spirit Tee" tree in Joplin, Missouri, one year after the tree was stripped bare by an EF-5 tornado on May 22, 2011. Joplin, Missouri, May 20, 2012, 5:34 p.m., Canon 5D, EF 70-200 mm f2.8L IS USM, f/6.3, 1/1000 sec., ISO 250. Photo by Christopher Mardorf / FEMA. Steel cross of St. Mary's Catholic Church in Joplin, Missouri, one year after the church was destroyed by an EF-5 tornado on May 22, 2011. Joplin, Missouri, May 20, 2012, 8:02 p.m., Canon 5D, EF 70-200 mm f2.8L IS USM, f/10.0, 1/800 sec., ISO 1000. Photo by Christopher Mardorf / FEMA. Devastated home near S. Grand Ave. and E. 22nd St. in Joplin, Missouri, one year after Joplin was struck by an EF-5 tornado on May 22, 2011. Joplin, Missouri, May 23, 2012, 5:01 p.m., Canon 5D Mark II, EF 24-105 mm f4.0L IS USM, f/11.0, 1/800 sec., ISO 400. Photo by Christopher Mardorf / FEMA. Devastated home near S. Grand Ave. and E. 22nd St. in Joplin, Missouri, one year after Joplin was struck by an EF-5 tornado on May 22, 2011. Joplin, Missouri, May 23, 2012, 4:58 p.m., Canon 5D Mark II, EF 24-105 mm f4.0L IS USM, f/10.0, 1/640 sec., ISO 400. Photo by Christopher Mardorf / FEMA. Devastated building near S. Jackson Ave. and W. 26th St. in Joplin, Missouri, one year after Joplin was struck by an EF-5 tornado on May 22, 2011. Joplin, Missouri, May 21, 2012, 8:01 p.m., Canon 5D Mark II, EF 24-105 mm f4.0L IS USM, f/8.0, 1/250 sec., ISO 400. Photo by Christopher Mardorf / FEMA. New home construction near W. 26th St. and St. Wall Ave. in Joplin, Missouri, one year after Joplin was struck by an EF-5 tornado on May 22, 2011. Joplin, Missouri, May 21, 2012, 7:52 p.m., Canon 5D Mark II, EF 24-105 mm f4.0L IS USM, f/11.0, 1/250 sec., ISO 400. Photo by Christopher Mardorf / FEMA. Hand carved ”bird of hope" near the temporarily renamed "Hope High School" in Joplin, Missouri, one year after Joplin was struck by an EF-5 tornado on May 22, 2011. Joplin, Missouri, May 20, 2012, 5:40 p.m., Canon 5D Mark II, EF 24-105 mm f4.0L IS USM, f/13.0, 1/500 sec., ISO 800. Photo by Christopher Mardorf / FEMA. American flag waves in the breeze near new home construction in Joplin, Missouri, one year after Joplin struck by an EF-5 tornado on May 22, 2011. Joplin, Missouri, May 21, 2012, 7:50 p.m., Canon 5D Mark II, EF 24-105 mm f4.0L IS USM, f/9.0, 1/400 sec., ISO 400. Photo by Christopher Mardorf / FEMA. City water tower in Joplin, Missouri, one year after Joplin was struck by an EF-5 tornado on May 22, 2011. Joplin, Missouri, May 22, 2012, 7:32 p.m., Canon 5D Mark II, EF 28-300 mm f3.5-5.6L IS USM, f/10.0, 1/800 sec., ISO 400. Photo by Christopher Mardorf / FEMA.